Today we are going to share a detailed guide on how to install January 2019 Android Oreo firmware on Galaxy S8 / Galaxy S8+ smartphones. Samsung has confirmed already official Android 9.0 Pie for these devices soon. For now, Samsung has started rolling out a new build which comes with new January 2019 security definitions and bug fixes, as Android Pie isn’t finalized yet. Samsung starts rolling out this official stable update via OTA (Over–the–Air), which means not all users can get the update at the same time. If you can’t wait until this OTA update reaches in your region, however still you can install January 2019 Android Oreo Firmware for Galaxy S8 and S8+ by using Odin app. We highly recommended taking a full backup of all your valuable data. This specific official firmware comes with build IDs G950FXXS4CRLB and G955FXXS4CRLB that carries the new January 2019 security definitions, bug fixes, and performance improvements. Proceed to the given guide to update Samsung Galaxy S8 / S8+ to Android 8.0 January 2019 build. We’ll use the latest ODIN tool to flash this firmware update onto Galaxy S8 / S8+ as the firmware is an official one signed by Samsung. 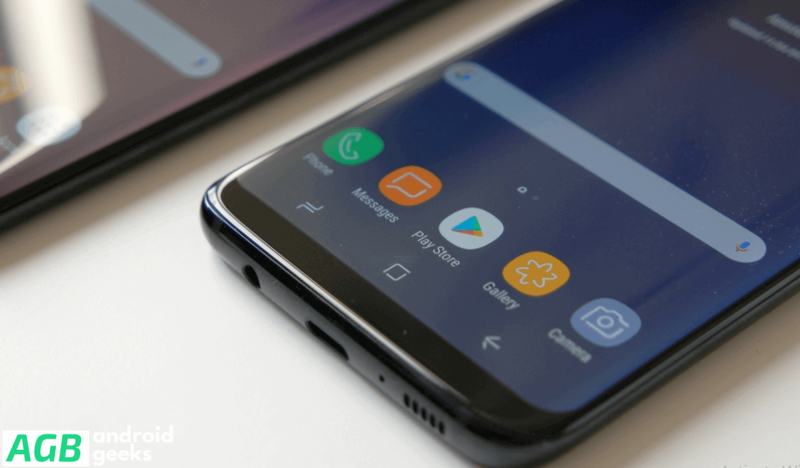 This guide containing the Official January 2019 Android 8.0 firmware and instructions are working with only Galaxy S8 and S8+. Do not try to install this firmware on any other device or incorrect variant. Verify the model number of your device by navigating to Settings > About Phone. AndroidBlog.gs will not responsible for any damage occurred to your Samsung Galaxy S8 and S8+ during or after the installation of Android 8.0 Oreo Proceed at your risk. Make a proper backup of all the existing data and settings of your Galaxy S8 and S8+, in case anything goes wrong then you’ll be able to restore your data back. Verify that you’ve correctly installed the Galaxy S8 and S8+ USB Drivers on the PC. Enable USB Debugging Mode on your Galaxy S8 and S8+ by navigating to Settings > Developer Options > check the USB Debugging option. If your device is running on a custom ROM, then after installing this stock update, you’ll lose it. If the Galaxy S8 and S8+ will no longer belong to a rooted version, once the stock firmware installed. Check the battery level of your Galaxy S8 and S8+, make sure that the battery of your device is about 80% before proceeding to the installation guide. 1: – First, download January 2019 Oreo Firmware and Odin v3.13.1 for Galaxy S8 and S8+ on the desktop of your PC. 2: – Now, extract the archived contents to get the tar.md5 update file. Don’t extract the tar.md5 firmware update file. 3: – Turn OFF your Galaxy S8 and S8+ to boot into Download Mode. 4: – Turn the device ON by pressing and holding the Volume Down + Home+ Power keys at the same time for a while till the construction Android robot and a triangle appear. Now press the Power button once again to confirm to enter into Download Mode. 5: – Launch Odin tool on your PC as an Administrator and plug your phone into your PC while your phone is in the Download Mode. 6: – One of the ID: COM boxes will turn yellow with the COM port number once the phone is connected successfully. 8: – In Odin, make sure that the Auto Reboot and F. Reset Time options are ticked, but the Re-Partition option should be unchecked. 9: – Click on the Start button in Odin to initiate the installation process. It will take a few minutes. 10: – Finally, after the installation process successfully completes, the Galaxy S8 and S8+ will restart. Unplug the phone after you see the home screen. Done! You have successfully installed the January 2019 Android Oreo Firmware for Galaxy S8 and S8+.